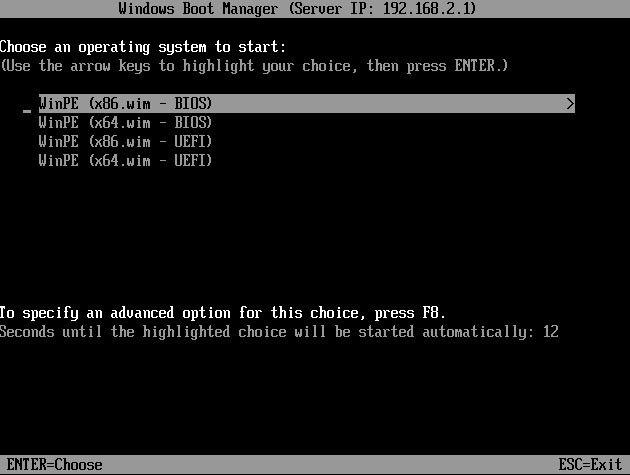 It's possible to setup a PXE server to boot more than one version of WinPE - one method was covered in the wimboot section of this guide (here). It's also possible to use a BCD Store with multiple entries as an alternative to wimboot - this is covered below. WinPE operating system files are contained in a .wim file - despite most instructions specifying the use of boot.wim the name of the .wim file is irrelevant. One of the main reasons for using boot.wim (in the path \sources\boot.wim) is convenience - the BCD Store that ships with WinPE usually uses this path and it saves building a new store. Provided that the BCD store contains a corresponding entry for the file an alternative name (to boot.wim) and path can be used. The device type (e.g. ramdisksdidevice) must be set as boot - not partition, locate, etc. The boot device (e.g. ramdisksdidevice boot) is the TFTP root directory and any paths specifed (e.g. ramdisksdipath \boot\boot.sdi) are relative to the TFTP root directory (e.g. C:\pxesrv\files\boot\boot.sdi ). 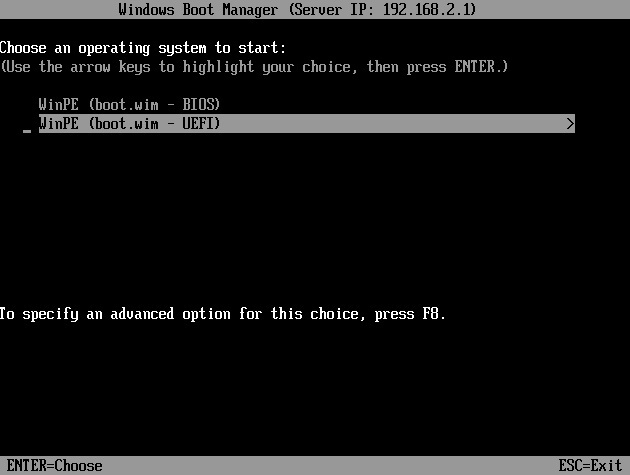 The path to the BCD store when booting a client system with UEFI firmware might be different. 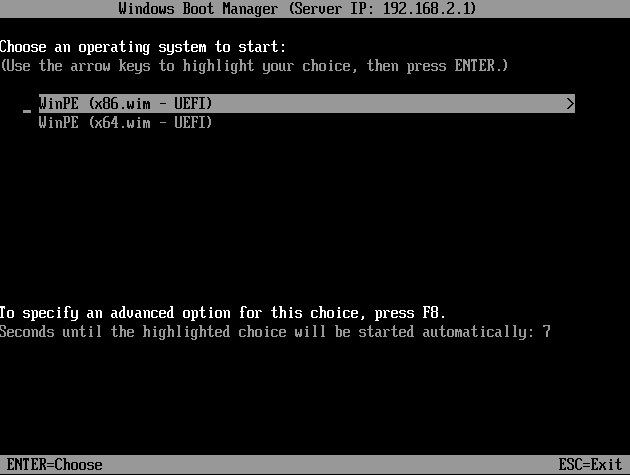 The default path to the BCD store is usually \EFI\microsoft\boot\BCD - this still applies if PXE Booting a Windows 7 based WinPE (WinPE 3. *), however a Windows 8 based WinPE (WinPE 4.0/5. 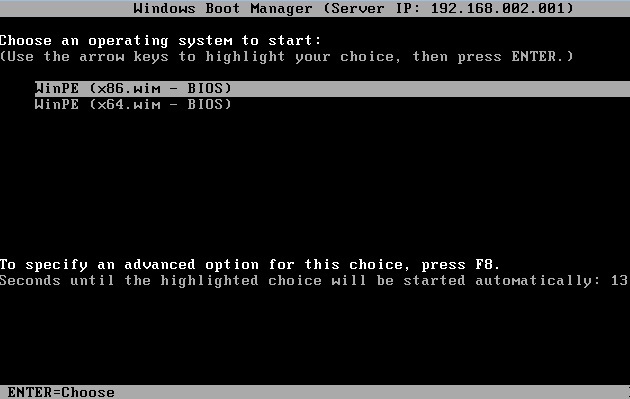 *) will use the same path/file as systems with BIOS firmware (\boot\BCD). My personal preference is to keep all WinPE files in one directory - all of the BCD stores in this section consequently use the \boot path for both .sdi and .wim files. As stated previously, the WinPE operating system files are contained in a .wim file. The ramdisk used to mount the .wim file so that the filesystem is accessible once WinPE has booted is contained in an .sdi file - usually \boot\boot.sdi. Again, this filename and path can be changed as long as the BCD store contains a corresponding entry. In my own tests I have been able to use the same .sdi file for booting WinPE 3.*/4.0/5. * on UEFI and BIOS systems and have consequently used the \boot\boot.sdi file\path in the examples below out of lazyness convenience. "...The default TFTP block size value is 1432 bytes...We recommend that you go up in multiples (4096, 8192, 16384, and so on) and that you not set a value higher than 16384...."
Changing either of these settings may cause issues - depending on the network infrastructure. 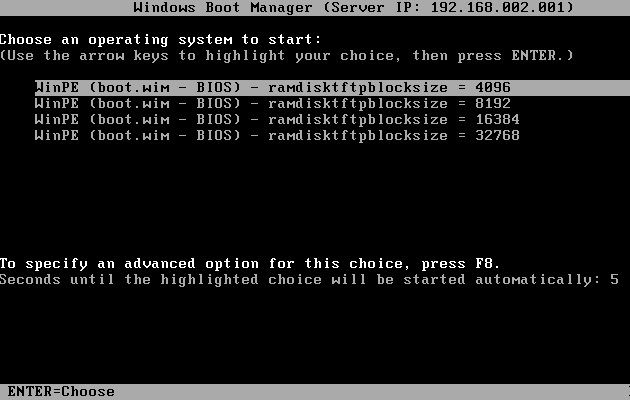 There are reports of issues with PXE booting in VMware using a RamDiskTFTPBlockSize larger than 1432. "...VMware does not appear to support RamDiskTFTPBlockSize above 1432 due to no support to deal with IP Fragmentation. However, it has been found that it is much better to adjust RamDiskTFTPWindowSize instead of RamDiskTFTPBlockSize to speed up TFTP (reduces amount of ACKs required and does not cause IP Fragmentation). VMware and other vendors all appear to handle this scenario perfectly..."